Is Darling’s Boiler Scrappage Scheme Enough? The Chancellor’s pre-budget report for 2010 has an obvious hint of pre-election bias about it, at least so far as it could have taken a tougher stance on the national debt. 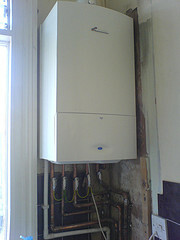 However, as previously discussed in this blog, the pre-budget report represents good news for domestic energy consumers in so much as the Boiler Scrappage Scheme will allow up to 125,000 homes to benefit from a cash incentive of £400 for replacing old central heating boilers with a newer, more energy efficient condensing boiler. Clearly, this is likely to benefit energy consumers who can, according to the Energy Saving Trust, expect to save around £235 per year on gas bills. Furthermore, gas boilers are thought to account for around 60% of the carbon emissions from an average UK home, so it is entirely sensible to address the efficiency of such boilers in order to meet environmental targets. Notwithstanding this, is the Boiler Scrappage Scheme’s cap of 125,000 households enough to make a significant difference to the environment? In consideration that there are approximately 4.5 million households in the country that could apply for the £400 cash incentive, it is quite clear the cap fails the scheme’s potential in so far as it only accounts for 2.7% of eligible households. Nevertheless, the boost in new boiler installations will help to stimulate the economy whilst it is also predicted to cut carbon dioxide emissions by 1.26 tonnes per home per year. Other green measures outlined in Alistair Darling’s pre-budget report include the feed-in tariff scheme, which will start in April 2010 and aims to guarantee the minimum value of power returned to the National Grid. Indeed, the feed-in tariff scheme is expected to earn households that generate their own green electricity through wind and solar power around £900 per year on average. Moreover, this figure would not be subject to taxation. The Chancellor also reserved an additional £200 million for existing energy efficiency initiatives, which include cavity wall and loft insulation, that would benefit a further 75,000 homes nationwide. I think it is a fantastic idea and will save the lucky 125,000 people hundreds of pounds per year, which in todays climate is alot of money! We will certainly be doing everything we can to help the people of Harrogate and York reap the benefits of this scheme. Hopefully if this scheme is a success, other energy saving schemes will be rolled out to help protect the future of our environment and also our back pockets!